March 21st, the German Hunting Association (DJV) issued a press release against canned hunting of lions in South Africa. CACH took the opportunity to elicit the background of this development in an interview with a vehement opponent of this “sport”. CACH: When did you hear for the first time about the lion breeding industry in South Africa and the associated canned hunting industry? M.K. : I learned about this perversion during one of my many trips to southern Africa about eight years ago. My good friend Ronnie Rowland, the former president of the South African Association of Professional Hunters (PHASA), told me that he had been opposing this practice for about 15 years. He wrote open letters to the media and resigned as honorary president of PHASA because the majority of the PH’s did not agree with his opinion. For my African friends and me, it is very important, to avoid the words "hunting" and "hunter" when discussing the excesses of the lion breeding industry. In our understanding such machinations have nothing to do with hunting - and someone who participates in this abhorrent practice has forfeited the right to call himself a hunter. CACH: Many aspects of canned hunting are incompatible with the principles of ethical hunting. These stipulate that the aim of hunting should not be killing just for the purpose of killing. In the case of canned hunting, there is no other explanation. How do you see that? M.K. : None of the aspects of canned hunting are compatible with the principles of ethical hunting. The sole definition of hunting is the sustainable use of wild animals. Everything hunters around the world do, must be judged by these principles. Here in Germany, high in the mountains of Asia, in the African savannah – everywhere. “Executing” animals that are specifically bred to be shot could never meet this definition - no matter if these pitiable creatures are released into the wild for a short time or are fenced off in large areas. It is also completely irrelevant how big such fenced-off areas are. It is often advertised that it "is just as difficult to hunt such animals in large enclosures as in the wild". That may even be true – however, these animals are hand reared and have lost all fear of people in general, but to a “rookie” it still looks like a "wild animal". Interesting is also the point of view of the breeding industry and its supporters, claiming that canned hunting reduces the hunting of lions in the wild. They should just come clear that at the end of the day it has nothing to do with a „conservation project", but simply is a profitable business model. That's why the hunt of wild lions is only possible in a few places and why you need at least 21 days. People who cannot or will not afford 60,000 to 80,000 US dollars, should refrain from looking for cheaper options. The alternative cannot be the booking of a 3-day trip with the guaranteed execution of a lion in a "lion brothel". As well as many conservationists and hunters around the world I regret the sad fate of the Zimbabwean lion who gained worldwide fame as "Cecil". Unfortunately, he only earned fame when he was dead. But considering the decline of the overall population of lions in Africa, his death was totally insignificant. In the last few months about 60 lions have been killed illegally by local farmers in northern Botswana - not one of them made it into the world press as Cecil did. The bottom line is: only the sustainable use of wildlife makes it interesting for the local people to tolerate wild, dangerous animals. When the local farmers lose cattle to lions or leopards, the loss can be compensated from the proceeds of sustainable hunting. If such compensation is lacking, one should not be surprised if the local farmers kill lions to protect their livestock. Who would blame them when their families struggle to survive? CACH: In South Africa, PHASA (Professional Hunting Association of South Africa) has distanced itself from Canned Hunting several months ago. In March, the German Hunting Association has now issued a similar statement. Why this change of heart? What has been the approach over the last couple of years? M.K. : For more than 10 years, PHASA had problems with the lion breeding industry in South Africa. It took them that much time to distance themselves from canned hunting, because for many PHASA members it was and is simply a good business model. At this point we can rightly speak of a change of heart. The PHASA statement is a milestone on the road that leads to the ban of canned „hunting “. It could be the end of the revolting lion breeding industry. For the German Hunting Association (DJV) it was not really a change of heart. Unlike PHASA, whose members not only tolerated this dirty business for years but also made it possible through their assistance, the DJV has never advocated this bloody business. In more general statements, the German Hunting Association has distanced itself from the issue of breeding animals for hunting - without specifically aiming at captive bred lions. That was certainly a mistake. They could have been more specific. Triggered by the Blood-Lions campaign, hunters started organizing a resistance against this practice in winter 2015/16. Although people have been working on this in the background for a long time, the “Blood Lions” campaign acted as a trigger. Along with it came a ban on the marketing of Frankenstein Varieties (Artificial breeding of Antelope) in German-speaking countries. Unfortunately, it took until February 2016 for the two leading hunting fairs in German-speaking countries, the "Jagd und Hund" in Dortmund/Germany and "Hohe Jagd" in Salzburg/Austria to forbid offers of canned hunting and Frankenstein breeds. From 2017 on, exhibitors who violate this prohibition will be excluded from further exhibition. CACH: How did the industry respond? M.K. : 2016 is a "year of transition" for all involved - the participation of exhibitors at this year's fair was based on the current legal guidelines for these trade shows. The prohibition was not implemented yet. But there was a request to voluntarily renounce such offers. An appropriate legal basis for sanctions was still missing. However, this does not mean that the initiators have simply accepted violations tacitly. Those who still offered deals which involved canned hunting or Frankenstein breeds in 2016, were visited by the fair management and representatives of hunting associations, especially the Landesjagdverband NRW and the Salzburg Hunting Association. Unwilling exhibitors proclaimed that they had made exactly the same offers a few weeks earlier at trade fairs in Eastern Europe. The officials made it unmistakably clear that this will no longer be tolerated in Dortmund and Salzburg. CACH: The most powerful hunting lobby worldwide, the SCI (Safari Club International), still accepts canned hunting. SCI has a scoring system that aims at gathering tons of trophies in the shortest possible time. This reminds me of statements by Dr. Jörg Mangold (Chairman of the Ethics Council of the Bavarian Hunting Association): "Even in our ranks (Note: the hunter) there are contemporaries, whose direct descent from the Stone Age hunter is unmistakable" or also "A hunting ground is an ecosystem and not a playground for stressed managers". M.K. : I am stunned as you are by the handling of canned hunting by the SCI. Their way of thinking is as alien to me as it is to you. Against this background I find some sequences in “Blood Lions” particularly disturbing and distasteful, especially where the focus is placed on the SCI and US-hunting fairs. I want to stress that the SCI and its affiliations with the lion-mafia has nothing to do with hunting, as we understand it. On the contrary, these hunters inflict serious harm on the world of hunting. 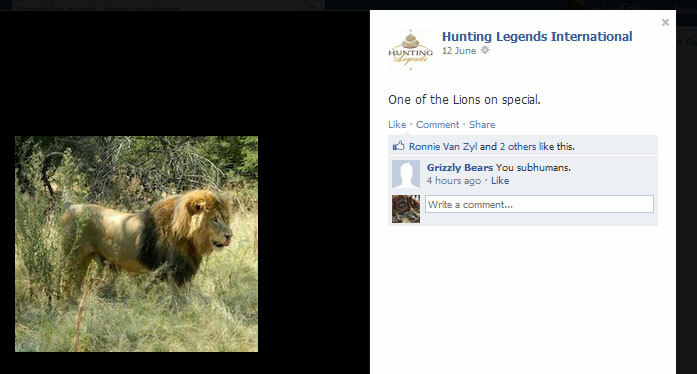 To exchange ideas on the topic of canned hunting, I will meet up with the head of the SCI in the next few months. It is important to clarify our major concerns - given the inevitably fatal consequences that will definitely arise if the SCI will not finally distance itself of these unspeakable depravities. If all goes well, that would be the gravestone of the lion breeding industry. CACH: Which target group is interested in canned hunting? In the movie “Blood Lions” it is shown that the hunters arrive on the first day, shoot the lion on the second day and fly back home on the third day. Are these really stressed-out managers looking for some ‘relaxation’ or are they bargain-hunters? M.K. : May be some of them are naive people who actually believe that the execution of such a regrettable lion has anything to do with "wild animals". But that will certainly be only a very few. Not too many can be that stupid. Most "lion executioners" (no matter where they come from) do this (with high probability) to complete their personal Big-Five in an "elegant", "comfortable" and cheap fashion. They do not reflect that this has nothing to do with hunting – but instead inflicts heavy damage on hunting in itself. It creates a market that uses an unscrupulous, profitable and perverse industry, which is in my opinion extremely sad. Against this background, it must be the goal of all "real" hunters around the world that SCI removes all scores made through canned „hunting“ from their ominous record books. CACH: In 2011, you were invited to Namibia to attend a meeting about the Erongo directory. In what does the Erongo directory differ from conventional record systems? M.K. : Unfortunately, the name Erongo directory (ED) is misleading. It is much more than an alternative record book for African trophies (as a supplement to Rowland Ward or SCI). The ED is an initiative working in many places for a renaissance of natural, sustainable hunting. - only individuals that are not fit for reproduction may be hunted. This explains the difference with regard to the trophy hunters who follow the guidelines of SCI: according to the criteria of the ED, the trophy itself is not the main goal of the hunt. Of course we enjoy a strong, mature trophy - but to us the hunt is about the consequences for the remaining animals and the question of the preservation of the natural habitat of the hunted species. For a SCI lion hunter, it will all be about the magnificence of the mane. According to the ED criteria, the social status of the killed lion is the key criteria: the dominant male should never be hunted. In such cases, the consequences for the rest of the pride are fatal - the subsequent dominant male will kill all the cubs to quickly pair with the lionesses and ensure his own genetic survival. 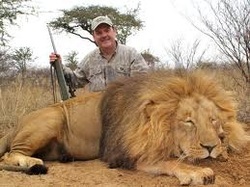 Shooting a dominant male lion provokes the death of countless other lions. For an ED-hunter it is primarily not important what the mane of the lion looks like, instead it must be ensured that he is old enough and no longer leads the pride. The same applies to elephants. Whereas a conventional trophy hunter wants to bring down a bull with long tusks, the ED-hunters studies the social, biological status. Elephants change their molars six times in a lifetime - when the last teeth are worn, they are doomed to starvation. Exactly such old bulls are what the ED hunter is looking for. May be it is not the most beautiful trophy. But that’s not the point. An old bull that is going to die soon anyway, that’s the elephant we are looking for. I hope that these few examples show what the ED wants to accomplish. CACH: What has been done in this regard since 2011? Has the Erongo directory been able to enforce itself? M.K. : We are not so naive as to believe that our little group can change the world. But something has changed definitely. The majority of fenced-off farms in Namibia disappeared in the last 20 years. What we need is a new generation of hunters. To them we offer a sustainable alternative to the traditional trophy craze. And sometimes dreams come true even faster than you can imagine: in 2012 I dreamed that visitors coming to the trade show "Jagd und Hund" in Dortmund would not ask first about a bargain price and how many of exotic wildlife species they could execute in 7 days. At that time, we were considered as ‘idiots’ and ‘traitors’. In 2015 we have awarded for the first time certificates to outfitters offering traditional, sustainable and fair hunts – meeting our criteria. In 2016 the ED-group was insulted by several exhibitors – claiming a lot of potential customers were craving for canned hunts ... and asked for fences. So quicker than we thought our message seems to catch on. Like a stone that is thrown into the water, drawing circles. Even if it is inconvenient and we are viewed as traitors we will continue to be such a "stumbling block". CACH: The lion breeding industry in South Africa has its income from canned hunts, but also profits from tourists, wishing to be photographed with lion cubs and volunteers that raise these cubs. Bones are sold to China eventually. Critics say a ban on canned hunting would cause even more welfare issues for the animals that would be bred for the bone trade solely. Would you agree with that? M.K. : I absolutely agree with CACH that all aspects of the disgusting lion breeding industry are objectionable to the same extent - and must be abolished. The bloody business of the lion breeders will not become less reprehensible if single market segments would be cancelled. The business of lion breeding is intrinsically bad. Society will decide about the future of lion breeding. In the case of South Africa, campaigns as the ones from CACH and Blood Lions are steering this process actively and with all possibilities of today’s social media and its influence. We, at the Erongo directory are doing our part. If we can help you - we are on your side! This is called a "sport". Taking the life of a tame lion which has been used to make money since it was only 3 days old. A lions whole life is cruel exploitation and this is its tragic and brutal end. “The African lion is smuggled out of its homeland, destined to become a burger patty, a magic potion, or a floor mat. Harvested in superficial conditions and chopped up and sold for parts, the largest carnivore in Africa. Now too big to be petted or walked with. These lions will live in overcrowded and often filthy enclosures, until they are big enough to be 'hunted'. Food is placed in a location to keep the lion occupied while the hunting operators drives around in circles with the 'hunter'. Suddenly the lion is spotted and shot while it eats peacefully. The lion does not expect to be shot as it has grown up being fed by people all its life. This is the last betrayal. 4. Hunting is not only restricted to men. Women and children are encouraged to kill defenseless animals. This beautiful animal, in the prime of his life, has been reduced to a 'special'. 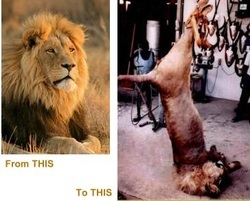 Lions tortured all their lives so that they can adorn the floor or wall of someones house. Lion meat is even sold at restaurants. Some people find it entertaining to dine on lion meat. Killing beautiful animals in the cruelest way is now called a 'sport'. Inflicting the worst kind of pain on defenseless, tame animals is considered fun. There is no crueler or more terrifying way to die, than to be chased down and shot. This video shows the ugly side of this 'sport'.